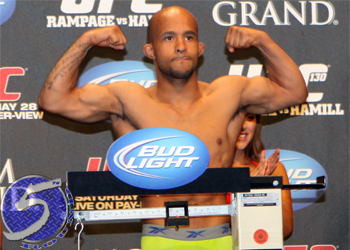 At 125 pounds, Demetrious Johnson (pictured) is currently the smallest UFC champion. However, UFC president Dana White believes the reigning flyweight king is still big enough to headline future pay-per-view shows despite the rumored lackluster numbers UFC 174 did last month. “Demetrious will headline another pay-per-view, he’s the champion,” White stated over the weekend. “He could fight on FOX, too. Cain Velasquez fought on FOX. Anybody could fight on FOX. Anybody could fight on pay-per-view. Johnson became the UFC’s inaugural flyweight champ five outings ago, but finally headlined his first PPV last month in a decision win over Ali Bagautinov. Reporter Dave Meltzer’s unconfirmed report claimed the card did less than 100,000 buys. Despite being a promoter, White has changed his stance to a take-it-or-leave-it approach. The UFC hosts roughly 50 events each year – showcasing far too many watered down scraps, if you were to ask many pundits – so White says simply watch the ones you want and stop crying. “So it’s my job to make everybody in the whole f****** world watch a fight?” an agitated White asked. “It’s an impossible job … Demetrious Johnson is one of the best pound-for-pound fighters in the world. Like Joe Rogan says, he’s the fastest fighter in the sport, and a lot of other great attributes. You’re either a fight fan and you want to watch this guy fight, or you don’t. There’s a certain amount of people that do, there’s a certain amount of people that don’t. We’re doing 50 fights a year. Despite what White says, it would be shocking if Johnson gets top billing on a UFC PPV for his next scrap. Expect for it to appear for $FREE.99 on FOX or Fox Sports 1.